Join me in raising funds and awareness for United Hatzalah of Israel. I am doing this In Recognition Of Lets help Hatzalah help everyone! . Please help me raise money for Hatzalah by sponsoring my daily learning. 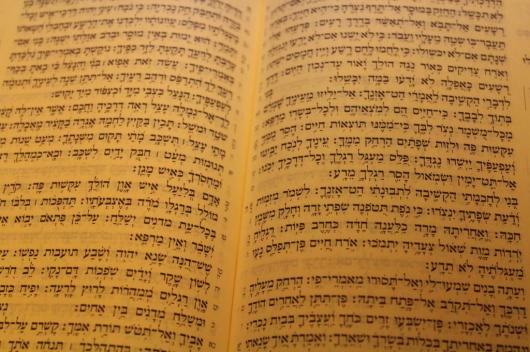 I am learning Tanach daily with the hope and plan to finish the entire Tanach plus Malbim on Nach by next Simchat Torah. I hope to raise enough to purchase an EMT ambucycle that will help save lives here in Israel. Any amount you wish to donate will be a great help. I hope that by my learning and your sponsorship we will together be zoche to see shalom here in Yerushalayim Ir Hakodesh and for all of Am Yisrael B'mheira B'yameinu, Amen. כל הכבוד אילת חזקי ועמצי BUBBIE MARSHA and ZAIDIE MANNY ARE VERY PROUD OF YOU! I would like to donate $100+2.5% monthly, beginning March through December, 2019. Dear Ayelet, We are friends of your grandparents in Riverdale. With all the yom Tovim this past month, I was only able to read your email now. You must be a very special young lady! It takes a certain level of maturity to recognize the importance of giving to others, particularly those that risk their lives in an effort to save those that are in need. Keep up the learning and may you, your family and all of klal Yisroel be safe and strong. In honor of the amazing Wasserman family who inspires so many. Ayelet - you are an incredible inspiration! שתלכי מחיל אל חיל!!! Kol hakavod to you and your family for all that you do for K'lal Yisrael. You are wonderful role models for us all. keep up the great work!!! your sister Moriya. Kol Hakavod for doing this campaign! Ayalet, Grandpa Gordon and I are so proud of you. With this donation, we share in the mitzvah which you so diligently fulfilled. Tizkle L'mitzvos! This is a very impressive undertaking--may your family continue to shep nachas from you. Gmar chasima tovah! Wow! What an undertaking! You make a substantial contribution to Am Yisrael, learn tons of hours, and become one of the few people on the face of the earth to take real familiarity with the extraordinary thought of the Malbim with through life. Your parents - and HKBH - have to be super-proud! Ayelet - you are a truly amazing young woman. Ayelet, I continue to be inspired by your motivation, consistency, and great achievements from afar. Thank you for affording me the opportunity to be part of your mission. Keep up the amazing work, I look forward to hearing of your next undertaking! G'mar chasimah tovah to you and your wonderful family! Dear Ayelet, You are truly a source of pride of B'nei Yisrael! You are truly an inspiration to me and our children. Thank you for what you are doing! Mazal tov to you! I wish that you and your family remain safe and in good health. May your good deeds be an inspiration to others. Our family has great admiration for your efforts! I'm a friend of your grandmother. I know she is so proud of you. Continue on this wonderful endeavor. We are SO proud of all you do for klal Yisroel and are thrilled to make this donation to help Hatzalah achieve its goal of helping people in dire circumstances. Thank you for being such a special person and granddaughter. Keep learning!! We love you. Dear Ayelet, Congratulations on your remarkable achievements. We are so impressed and proud! Beautiful project, wonderful cause, amazing young lady!! With total support from your friends in Florida. Ayelet Your efforts and drive are incredibly impressive ! It is s privilege and honour to help you. Kol hakavod!!! great job ayelet, we're so proud!! keep up the great work!! Great job Ayelet! Keep up the great work! In memory of Rabbi Jacob Twersky. Kol Hakavod to you Ayelet! Ayelet, you are an incredible inspiration! We are so incredibly proud of your learning and the great cause for the donation. We thank you for this unique opportunity. What a wonderful endeavor and example. Hatzalah is a wonderful organization. I am very Proud of you and your mission. I wish you to be the role model for the rest of her siblings the way her Mother is the role model for you. nI wish Ayelet the big success helping Israel and Jewish people-- Amen! so proud of your passion in helping save lives. may you continue to be a source of nachas to your wonderful parents and klal yisrael!! Ayelet, I am really impressed by your dedication and motivation! I'm proud to be able to say that I took part in your learning! Tizki l'mitzvot amazing young lady! Dearest Ayelet -- We continue to be so very proud of you. We are impressed -- but not surprised -- by your consistency in your daily learning for this project. May you succeed in accomplishing this and all of your other goals. Much Love, Omee and Opa. Everyone is very proud of your efforts, for such an important cause. Yosher koach on this project. Hopefully, terrorism will end soon and this ambulance won't be needed. If it is needed, hopefully it will be used to help the victims of terror and not the terrorists. Hatzlocha raba; thank you for your efforts to save the Klal. Kol ha kovod to you Ayelet! From your cousin in NY Tamar Sadeh. Keep up the good work. Best of luck! Thank you so very much for giving us this opportunity. You and your family should be bentsched! ALL of Klal Yisrael should be UNITED through your work. We should all have peace and safety in our lives. Yasher koach and tizki l'mitzvot!! Yashar Koach to you for your inspiring act of cheesed. I'm sure your parents are very proud of you. hatzlacha with your project; tizki lmitzvos harbei. Sad that it's necessary, but great project. Yasher koach! Tizku L'Mitzvos Ayelet! It's wonderful thing you are doing. yahser koach to you. may you continue to do good deeds on behalf of klal yisroel! Really a wonderful project. Hopefully you will be able to learn soon just for its own sake. This is a wonderful effort on your part. Well done, don't give up. Klal Yisrael can be very proud of you! What a beautiful idea! Kol HaKavod for undertaking this project! Yashar Koach! May Hashem answer your prayers and bring Shalom in the merit of your learning. What a great initiative. May your learning inspire others to learn tanach and bring shalom am yisrael. What an amazing thing your doing. Ayelet you are an inspiration! Thank you for helping am yisrael through your Torah study and by raising money for hatzalah. HAtzlacha with this amazing project! I am a friend of your aunt Giela who raves about what a special amazing girl you are! Keep making everyone proud and your learning should not only help raise the money but should also be the Zechus that klal yisroel needs right now! Great cause! Thank you for your good work. Dear Ayelet. You are precious Jewish girl with the wonderful Neshama!! Thank you for this charitable fund! Tell your parents that I wish my grandson Jacob will be as kind and decent as you are!!! Proud of you! Love. Rose. B'hatzlacha and yiyasher kocheich, Ayelet! ×›×œ ×”×›×‘×•×“! ×³××™×œ×ª×³ ××”×‘×™× ×•×™×¢×œ×ª ×—×Ÿ! ×™×•× ×”×•×œ×“×ª ×©×ž×— ×¢×“ ×ž××” ×•×¢×©×¨×™×!